In Manhattan’s Times Square, over half a million revelers cheered as the twelve-hundred-pound illuminated silver ball perched high above them began its flirtatiously slow, seventy-foot descent marking the final seconds of 1957. When it finally it came, there were screams, kisses, toasts, and Guy Lombardo’s Auld Lang Syne. Few noted that the ball had flickered off before the bottom and that the 1958 sign had sparked on a trifle too early. The glitch reflected warnings offered by the year just passed about many things that were no longer as they had been. The Economy. After the Second World War there were more than enough new jobs for skilled and unskilled workers. Luck, timing, progressive governments, hard work, unionized labour, and the burgeoning manufacturing sector had helped create a thriving, urban middle class and economy that had never been so good for so long. In 1957, however, growth fell from a decade of 6% per year to an anaemic 1%. Paramount among its causes was that Europe and Asia had rebuilt and needed less of our stuff. Our monetary policy was being clumsily adjusted to meet the new reality. The good times that many had come to believe would never end were ending. A recession was only months away. Popular Culture. In 1957, for only the second year, rock ‘n’ roll gave voice to the young or young at heart who, perhaps unconsciously, rejected the white, Christian, male attitudes that reflected post-Depression and post-war cravings for calm, safety, and stability. Elvis Presley was rock ‘n’ roll’s most popular star. 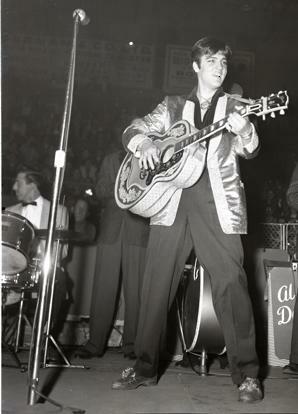 His concerts were always sold out and one Presley record or another was atop Billboard’s 1957 charts for 25 weeks. He epitomized everything that rock ‘n’ roll offered and threatened: a heterosexual in a gold lamé suit, a poor kid in a Cadillac, a white man singing black, and a mama’s boy who suggested all that mamas warned their daughters about. The flip side of rock ‘n’ roll was the Beat movement. The existential yearning at Beat’s core was expressed in Jack Kerouac’s scorching novel On The Road, published in September 1957. It followed Sal and Dean’s futile search for meaning in an America they found suffering from the emptiness of middle class consumerism. Beat met rock ‘n’ roll in July 1957 when, at a Liverpool church fête, sixteen-year-old John Lennon met fourteen-year-old Paul McCartney. The name of the band they formed – the Beatles – was a pun that poked fun at their music while nodding to the Beats. When times get tougher, pop culture always gets fluffier. When rebellions begin the grown ups fight back. Presley’s January 1957 TV performance showed him from the waist up to spare audiences the outrage of his gyrations. October saw the premiere of Leave It To Beaver. It joined similar TV fare legitimizing values that so many of the white, urban, middle class had internalized and assumed to be natural and perennial. They could be excused for not noticing so many of their children reading Kerouac, listening to Elvis, and that not everyone thought like Ward Cleaver or them. Race. For decades, Jim Crow’s unwritten rules separated Black and White in American and Canadian cities and towns. In January 1957, Martin Luther King became the founding president of the Southern Christian Leadership Conference. It drew legitimacy from the Bible, Declaration of Independence, and Constitution, and its non-violent tactics from Mahatma Ghandi. In September, inspired by Dr. King’s message, nine African American children attempted to enter Little Rock’s all-white Central High School. They were stopped by a screaming white mob. President Eisenhower sent federal troops. Every morning, armed paratroopers escorted the kids to class. Eisenhower introduced the first federal civil rights legislation in 82 years. 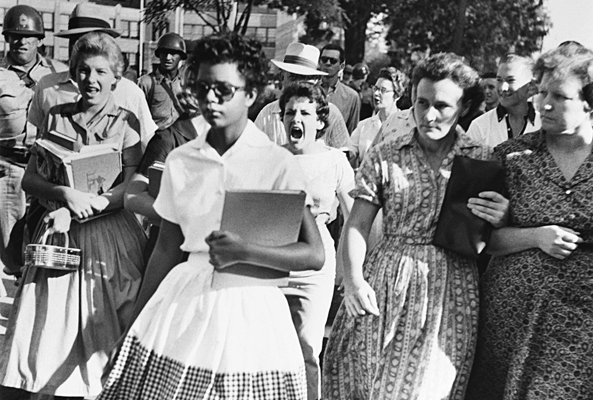 One of Little Rock Nine wading through racists to go to school. While slavery is America’s original sin, Canada’s is her treatment of aboriginal people. In 1957, the government and churches continued to ignore the protests of aboriginal parents by dispatching police and priests to steal their children. Native kids were forced into Residential Schools where many were beaten, sexually abused, and subjected to quasi-scientific experiments while taught to reject their heritage and themselves. Six thousand children would eventually die at the schools. In June 1957, Canadians elected Prime Minister John Diefenbaker. He championed civil rights and cultural diversity within a unified Canada. He would enact legislation granting Native adults the right to vote and then a Bill of Rights declaring all citizens equal under the law. However, also in 1957, Betty Friedan was asked to undertake a survey among her Smith College classmates who were preparing for their 15th reunion. She found complaints of having a family but not happiness and household gadgets but not fulfillment. Friedan identified the problem without a name and was inspired to dig deeper. Her research became The Feminine Mystique. The book would unleash the second and most powerful wave of the women’s movement. In June 1957, Prime Minister Diefenbaker appointed Ellen Fairclough to his cabinet. She was first woman to enjoy such a position. Cold War. In October 1957, the Soviet Union launched Sputnik, the world’s first artificial satellite. Every orbital beep was a braggart’s boast; Soviet scientists had bested Americans who, for two years, had been working on their own satellite. Sputnik threatened that nuclear weapons could be delivered not just by bombers that could be shot down but also by rockets against which there was no defense. Air raid siren tests pierced quiet afternoons. Emergency network drills interrupting television shows. People were taught to fear reds under their beds and over their heads. From now on, wars would have us all on the front line. Some years are portentous for what occurred and others for the warnings they whispered. The Times Square New Year’s Eve glitches were metaphors for 1957’s cautioning us that change was coming and a great deal that had been perceived as right or permanent were neither. In many ways, we continue to rewrite the rules and retest the assumptions that 1957 told us no longer applied.